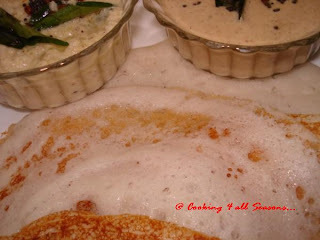 Cooking 4 all Seasons: Soft Dosa with Poha ~ 101 Dosa Varieties! I remembered this back from memories. It was a time when Amma was on a quest of preparing new dishes everyday. I really wish I had this blog then. One morning, getting ready and seeing it was already getting late for college, rushed down for a breakfast and saw Amma serving dosas. They were the white of the whitest and so very soft! I forgot that college was waiting or that I had a hectic time ahead. I forgot everything and just kept looking at those snowy white beauties. In wonder asked Amma what has gone into them. She said she used Atukulu! Well, Atukulu are something we have eaten only for Krishna Jayanthi. Only recently we have discovered the wonders one can enjoy with the humble Poha. So back then, thinking that Aval can also be taken avatars like this, was a wonder! I really enjoyed a hearty breakfast, a journey to college all forgotten. I loved it so much that I asked for it a couple of times. Then we all forgot about it. Now, necessity is something that forces us to think deep in the realms of mind and things you could remember are amazing. Since having announced a Dosa Mela, all I could think of were the different varieties I should conjure on. And somewhere from the back of mind, came the memory of that morning spent longingly on a plate feasted with Soft Dosas. Out of sheer need to have something to blog on, I worked on a plan to have these ready for today. I explained to Athamma what all she has to soak. Well get a new recipe and I have all ears. Athamma loves to hear me explaining the ingredients going into something and if I tell her that Amma had already prepared and we all loved it, she is all for it. Finally we had the batter ready and the first one to eat this, of course is Konda. She finished this in flat 5 mins. Since she was in a hurry to leave, I couldn't give another for her. And all of us really enjoyed. It came out soft and crispy. Though this is supposed to be spread little thick, you can make think ones and with oil, they turn out crunchy and crispy. Enjoy the goodness of poha all in a Dosa! Wash and soak Rice and Black Gram dal or Urad Dal for 3 hrs together. Wash well and Wash Poha well in water and mix all the 3 and grind in a mixie to a smooth batter. Allow it to ferment overnight. Next morning add salt, mix well, add more water if required to acquire dosa consistency. Heat a greased dosa tawa, spread a slightly thick batter on it. Sprinkle little oil over it. Cover and cook on medium flame. Cook on one side only. Remove and keep . These dosas taste delicious when served cold too and should be cooked with minimum il. Serve with your choice of side dish. I served it with coconut chutney and Ground nut chutney! This is going for my Dosa Mela. 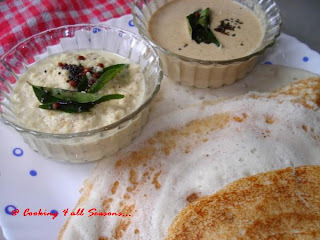 Have you thought of anything interesting for a dosa? Do join me in the celebration of Dosa and its varieties!